PLEASE NOTE: GMO seeds are commonly used in field crops like corn and wheat but will KILL broad leaf vegetables like tomatoes and lettuces. There are many misconceptions about GMO seeds used in planting typical vegetable gardens and Portable Farms® uses NO GMO seeds in our aquaponics systems. GMO seeds are commonly used in the crops corn, wheat, soy, cotton, sugar, zucchini, squash, papaya, aspartame, and milk products. 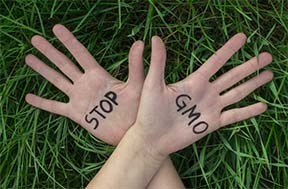 Here is a list of products containing GMO (scary list – we have always loved Thomas English Muffins, but no more). As previously discussed on this blog, a new federal law requiring labeling of genetically modified (GM) foods and food ingredients was signed into law on July 29, 2016. This law directs the U.S. Department of Agriculture (USDA) to develop regulations and standards to create mandatory disclosure requirements for bio-engineered foods by July 2018. Under the new law, food companies would have three options to disclose GMO ingredients: the use of on-package text, a USDA-created symbol, or an internet link — i.e., a QR code printed on the package that directs customers to GMO information. To support the development of the regulations and standards required by the new law, USDA is slated to conduct a study to identify potential technological challenges that might impact whether consumers would be able to rely on electronic or digital links on food packages. Industry will continue to keep a close eye on developments as they unfold, particularly with a new administration at the helm.